Let us make a suggestion for you: Black Bear Inn. Built in 2002, the inn’s modern yet rustic architecture blends seamlessly with the incredible scenery of the property’s 1.3 acres. 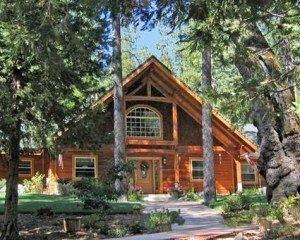 Surrounded by ancient Sequoias and manicured gardens, Black Bear Inn offers some fantastic outdoor amenities including a covered spa for year round relaxation, large patios, and many places to unwind – including a porch swing, a hammock, and several sets of tables & chairs with large market umbrellas. Innkeepers Bruce & Wendi Davison have been the inn’s proprietors since 2009. Their history in hospitality and management translates beautifully into inn keeping, and Bruce’s formal culinary training has been yielding wonderful dining experiences for the daily full Chef’s breakfast and customized wine, cheese and charcuterie pairings. The inn’s five guest rooms all offer king-sized beds with Tempurpedic mattress toppers and down comforters for comfy, cozy sleeping. Each suite also includes gas fire places, jacuzzi tubs, radiant heating and cooling, free wireless internet and private french doors leading to the grounds’ meadow. Each suite is given a distinct style — from the romantic Bordeaux room with its sumptuous reds and golds and cherry sleigh bed to the Italian-inpspired Tuscany room, from the cool ocean breeze feeling of the Monterey room to the cabin setting of the Calaveras room — allowing guests to customize their experience. Why not book a room in time for Arnold’s Art & Wine Festival on September 3rd and 4th? This year’s festival features more than 60 booths of homemade crafts, art, food and wine as well as live music by country/swing band Homegrown. Enjoy the food, enjoy the wine and crawl into your cozy retreat to make a true weekend out if it.